It’s a Mountain, It’s a Graph! Look at news on the stock market or a weather forecast and chances are good that you’ll see a column graph. We take graphs for granted; they’re ubiquitous. But such was not always the case–in the late 18th century and early 19th they were revolutionary, on the cutting edge of data communication, William Playfair having just developed them. The heights of a column graph’s bars correspond to the values plotted. When it comes to showing heights of various objects, column graphs are ideally suited as the bars physically (schematically, at least) mimic the phenomenon depicted with bar height representing object height. Of course, this is a map blog, not a graph blog; I’m interested in the graph style comparative view, where mountain or river glyphs replace the columns of a graph, with the size of each corresponding to actual height or length. The earliest comparative view of either the graph or vista style dates from approximately 1800. 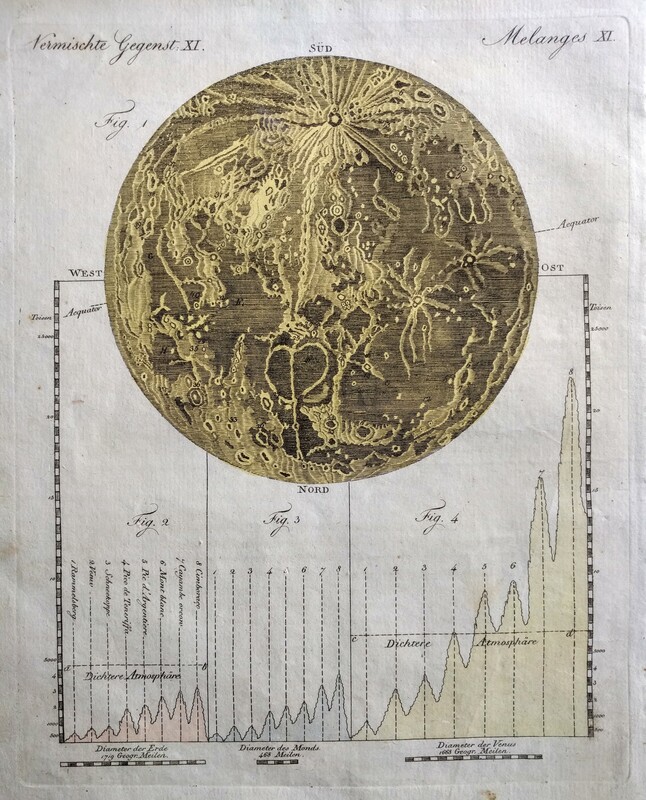 Bertuch’s Moon from his Bilderbuch, a children’s encyclopedia, with its graph style comparative at the bottom, is an enigma. No doubt influenced by Playfair’s graphs, he reports the heights of mountains (with some inaccuracies) in graphs where the “bars” are actually tiny mountain figures. In a later edition, probably about 10 years subsequent, he published a vista style comparative. Vista style comparatives, while gorgeous, are less effective in that their design doesn’t automatically instruct the reader to make comparisons. Why the switch? We can chalk this up to Goethe’s influence, which was in turn inspired by Humboldt. 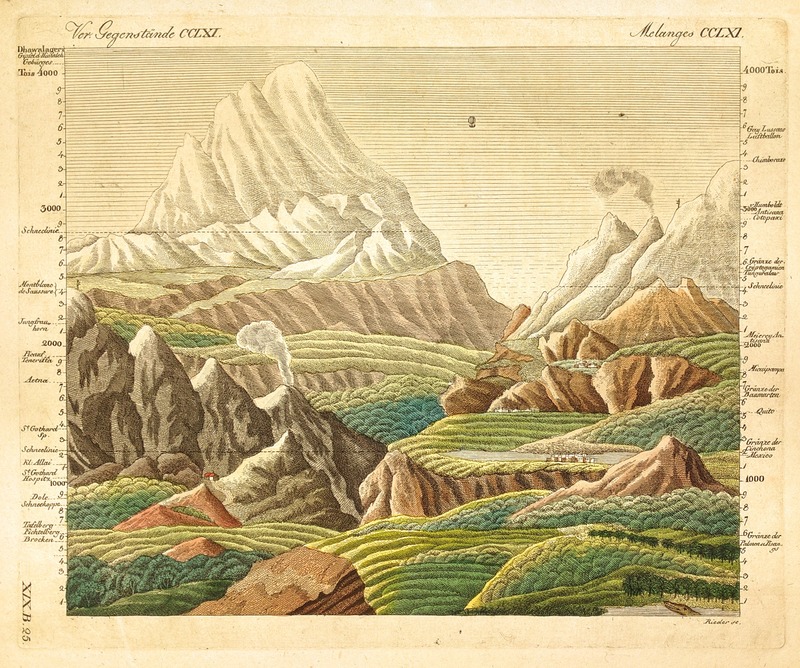 Goethe saw Humboldt’s proto comparative Geography of Plants and mimicked the format in his vista style comparative of old and new world mountains. Bertuch, Goethe’s associate, liked the idea and ran with it in his Hohen der Alten. It was this piece that gave rise to the period of vista style comparatives. What style of comparative do you favor? Do you ever find yourself having to walk back a previous statement? I previously credited Thomson and Lizars with the first comparative map, only to discover an earlier work by Bertuch. Well, it’s happened again; I discovered that Bertuch’s works contain an even earlier comparative. But that’s how research goes and it’d be boring without surprise findings! In about 1810 Bertuch published his Bilderbuch, kids’ books heavily illustrated with pictures of the world, nature, geography, and so forth. He included one of the first vista style comparatives, and a gorgeous one in color at that. Even earlier he published a graph style comparative, making that both the first comparative view known and meaning that the graph style of comparative emerged decades earlier than previously thought! Why, having established the graph style, did Bertuch switch to the vista style? The graph style of mountain comparative, that is where small mountain glyphs corresponding in size on the page to the relative height of the peak represented, took off in the 1820s. Previously thought to have been developed then, that idea is torpedoed by the discovery of this piece by Bertuch as it is c1800. The merit of the graph style is in its forcing the reader to draw comparisons between the peaks. With the vista style, where peaks are arranged in a fictional landscape, the reader can mistake it for just a lovely scene; not so with in the graph format. Bertuch showed eight terrestrial mountains, and eight on both the Moon and Venus. Chimborazo, tallest mountain as measured from the center of the earth, is a good benchmark against which to evaluate the mountains of the Moon and Venus (both with tallest peaks reported to be higher than Chimborazo). The peaks protruding from the Venusian atmosphere are erroneous. Venus is fairly flat; those perceived mountains were artifacts of the observing technology of the day and they’re nonexistent had been confirmed by recent radar surveys of Venus. My favorite comparative view? Actually a pair: John Tallis’ Comparative View of the Principal Waterfalls, Islands, Lakes, Mountains and Rivers of the Eastern [and] Western Hemispheres. 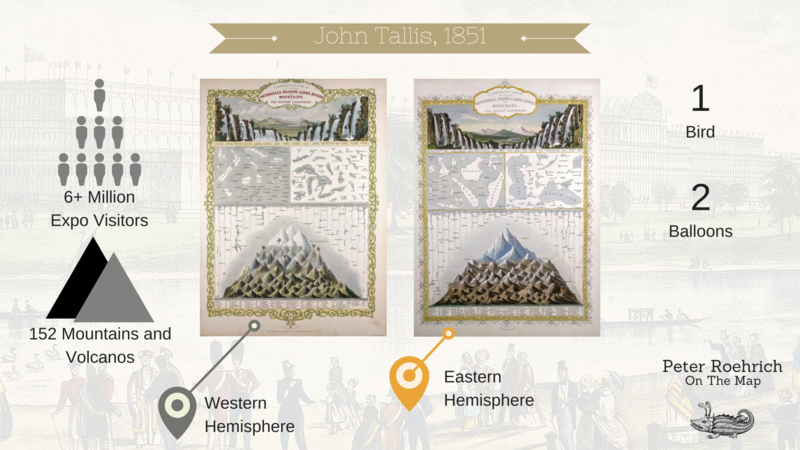 Infographic on John Tallis’ 1851 comparative views of the eastern and western hemispheres. (Own work). 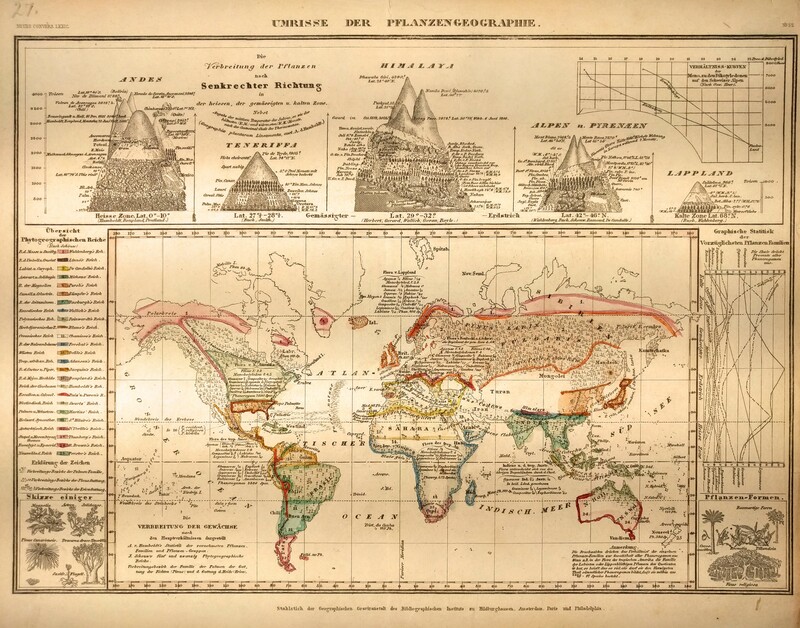 Published in 1851/by Tallis and engraved by Rapkin these comparatives were part of the Illustrated Atlas. This volume was produced for sale to attendees of the Great Exhibition in London. These lovely pieces are unique in that they are the only ones to show all 5 commonly compared geographic features on the same page. They are further unique in that they allow both the early style of comparative view at top, where the waterfalls are seen as a fictionalized landscape, and the later graph style with the mountains and rivers in a compound panel. Take a look at the infographic above for a few more facts. As an aside, I’m experimenting with graphic design in Canva; let me know what you think of my first product. What to learn more about comparative maps? Check out my free ebook! I am running a periodic series where I interview some of the people collectors come across. My purpose is to shed light on what they do and how they work, especially for new collectors. For the initial post in this series I interviewed Barry Ruderman, dean of the online map dealers. Barry Ruderman’s shop is located in La Jolla, CA, and does much of his business online. He sold his first map in 1991 and has had an online presence since the mid 1990s. He now sells some 4,000 maps annually. Barry enjoys the variety of his job, noting that while he knows what he’ll do each day, the exact topics that he’ll research always change. Further he enjoys working with the “wonderful things” and “interesting people” he crosses paths with. To that end, the research he engages in provides a “constant intellectual challenge” in “trying to understand the the who [and] how” of the antiquarian maps he deals in. And research he does! His listings provide a wealth of context on the pieces. On the trends and developments in collecting circles, Barry reports that he has observed an emerging interest in pictorial and fantasy maps, pieces showing non-geographical content. He explains that while the geography of New York City may not have changed substantively over the past 100 years, the people and activities have changed; pictorial maps show these changes. In another example, Barry described a pictorial map of Johns Hopkins Hospital in Baltimore, MD, which showed where to find “good looking nurses”, the intrigue in that piece being its elucidation of the sensibilities of the time that it was published. Further, he reports increased interest in manuscript material. In dialogs with new collectors, Barry often hears questions about the authenticity and valuation of antiquarian maps. He explains that maps are “self authenticating” in that the characteristics of the pieces make inauthenticities apparent; coloration, paper, and folds inform the identification of genuine maps. Generally speaking, a reputable map dealer will always look for and disclose concerns about authenticity, such as facsimiles. Barry points to his volume of 4,000 maps per year, often seeing the same map several times, as the way he senses the value of pieces. Barry says the typical new collector is in his/her late 30s to 40s, but that collectors who start in their late 20s to early 30s often develop enviable collections. Further, he has observed changes in the collecting patterns in recent years. Where the “center of the gentleman’s library” used to be collected antiquarian catalogs, collectors have become less comprehensive, shying away from reference materials and focusing on their narrow area of interest. In the interest of full disclosure, I am a satisfied repeat customer of Barry Ruderman. Want to learn more about antique comparative views? Download my free ebook! What’s that Croc Doing There? Take a look at Bertuch’s comparative view Hohen der Alten; see that little surprise in the lower right corner? He tucked a tiny crocodile at the waterline, reminiscent of the sea monsters seen on earlier maps. Is this a modern sea monster? Probably not. To evaluate this, first I’d like to review the role sea monsters played on maps. 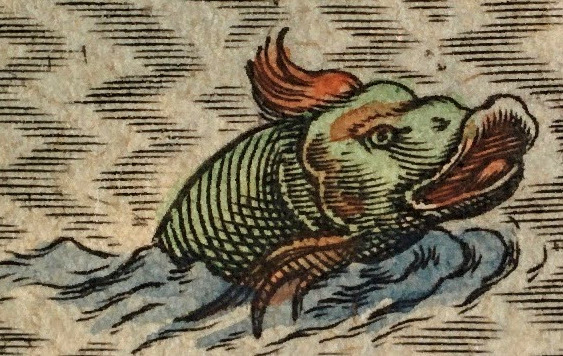 Sea monsters were a frequent feature of 16th and 17th century maps. They played several roles: aesthetic, cautionary, and even scientific. Where engraving was a labor intensive process it was expensive. To this end, a map with a sea monster on it would be more expensive that one without. As sailors would know where dangers were, unadorned maps would suffice for their purposes. From this we can conclude that these maps were made for aristocracy. Hinted at above, sea monsters often signified the unknown and the dangerous. Appearing on the periphery of a map may indicate the edge of charted, known territory. Moreover, they are larger than life hostile creatures which symbolize danger, real or perceived. Often overlooked, they further represent a scientific approach to understanding the unknown. Reflecting the Age of Enlightenment, they are an attempt to characterize the never before seen sea creatures in a logical, reason informed fashion rather than chalking then up as demons. Silly as they may appear now, the study of the oceans was in its infancy and much marine life was unknown. There are some great resources on sea monster maps, including a radio interview and an excellent article. So, why did Bertuch place a crocodile on his comparative? Bearing in mind that this was in a children’s book, it probably served two purposes. The first being too educate children about the animals inhabiting the earth, especially one not found in Germany. And the second reason being too amuse the children. Check out my free ebook to learn more about comparative views. Have you come across a map that you love, but know nothing about? Do you want to find more works by your favorite cartographer? Libraries with map collections, and of course librarians, are a great research resource, but there are some great online tools at your fingertips. These tools split nicely into two categories, with a little bit of overlap: collections and references. High quality digital imaging and the internet bring many library and private collections to virtually anyone with a connected device. One of the best is that of David Rumsey. A prolific map and atlas collector, Rumsey has imaged his collection and uploaded those images to his website along with metadata and background on the pieces. Further, his database has a tool that associates antiquarian maps with current digital maps allowing analysis of the changes over time. While I have not found every map in my collection in his database, he does have many of them. Many national libraries and archives have fantastic map collections available online. Both the Library of Congress and the British Library have wide collections. Many official land surveys and other maps drawn for government purposes are in these collections. My favorite, held by the Library of Congress, is an official survey of the Mason Dixon line. Some of these libraries will answer questions via email. Map dealers often have extensive research on their current holdings and sold pieces. Their online catalogs and descriptions are very valuable tools. Beyond digitized collections, the web brings a wealth of reference materials. Some of the collections above can also serve as references; the materials below are strictly reference. The History of Cartography series published out of the University of Chicago is a phenomenal, comprehensive set of volumes. Several of the volumes are made available free of charge. Google Books offers digitized books from the 19th century, many are searchable in some manner. These provide tremendous context in affording the ability to look up antiquated measurements, find contemporary accounts of expeditions, research land surveys, etc. Unfortunately, many do not print or download. Wikipedia is not an authoritative source as anyone can edit its pages and there is no telling how competent those editors are. However, an article with abundant citations is a great starting point. Using the references at the bottom of the page, you can track down the original sources and evaluate them for yourself. Interested in learning more about comparative views? Check out my ebook!